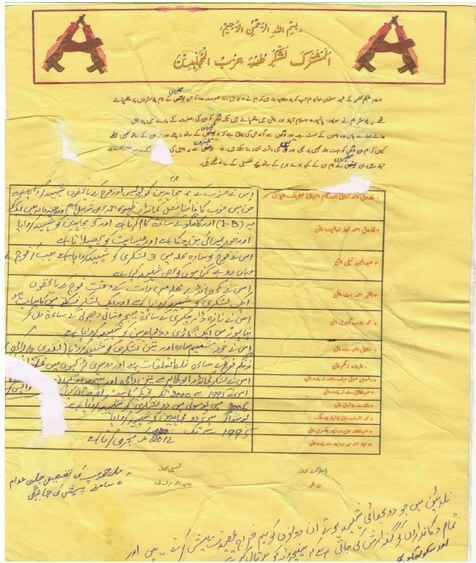 Earlier this week posters appeared in Pattan in Jammu & Kashmir’s Baramulla district, threatening to kill 13 persons for assisting security forces. 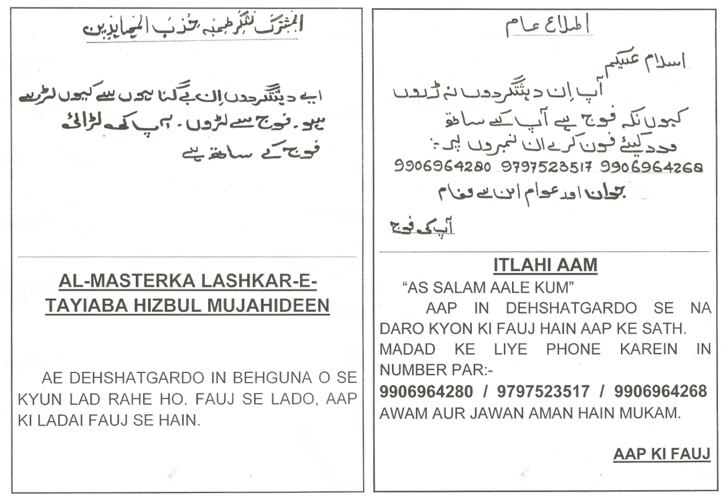 Here is the poster by a group with a grand sounding title of “Al Mashterqa Lashkar-e-Taiba Hizbul Mujahideen”. Here’s the Indian Army’s counter-poster. Now let’s see if the message gets through. Yesterday, reports in the media indicated that a terror alert had been sounded in Mumbai and across many Indian airports: five terrorists of the Lashkar-e-Taiba had entered the country and planned to target petrochemical installations in Mumbai using the sea routes. These reports were similar to those a couple of days earlier, concerning Gujarat, where coastal police tightened watch over offshore islands and the petrochemical complex at Jamnagar. Reports in today’s Pakistani newspapers reveal that three of the five alleged LeT terrorists are shopkeepers and a security guard from Lahore, who have sought police protection in the light of the Indian terror alert. So what, other than incompetence, are the possibilities? The first is that real terrorists used fake identities to enter India. If they have entered India, it means they are still around and might use the lowering of guard caused by this episode to strike. Also, the alerts indicated five terrorists. It is important, therefore, for the authorities and the media to treat the threat as ongoing and serious, and not drift into complacency. Second, this was an information operation designed to embarrass India and the United States, and use it to show that India always makes false accusations against Pakistan. By implication, Hafiz Saeed and Lashkar-e-Taiba were victims of a ‘false flag’ operation by India (and the United States) to implicate Pakistan. The best time for this would have been when Hillary Clinton was on Indian soil. However, by accident, inefficiency or design, the terror alert was sounded after she left the country. In the event the grand expose in Lahore turned out to be a damp squib. Be that as it may, the myth-making machines of Pakistan will turn this episode into a narrative of how Hafiz Saeed and Lashkar-e-Taiba are unfairly blamed by India and the United States. Even if its for domestic consumption, it’s still an effort that didn’t go waste. We must, of course, consider the Occam & Hanlon razors. Did India’s intelligence agencies goof up? They could have erred in terms of the existence of the threat, the presence of terrorists and their identities. Each of these is a separate issue. That said, at this stage, we are better off if they raise an alert at the risk of looking red-faced rather than let the fear of embarrassment cause them to less on the ball. Tailpiece: There’s also a chance that the Indian media put up the wrong pictures. How and why they’d end up publishing photographs of the three gentlemen from Lahore is a mystery. This increases the likelihood that India’s intelligence agencies were fed misinformation to either divert or embarrass them. We can only speculate the reasons for this. Embarrassing India during Mrs Clinton’s visit is enough of a motive. While it is unlikely that the ISI would wish to escalate tensions with India at a time when Pakistan’s relations with the US are close to breaking down, it would be inappropriate to dismiss the risk of a terrorist attack. Manage grievances, improve social capital, take security seriously and get better ambulances. This appeared in Saturday’s DNA. It’s not difficult to set off a bomb blast in Mumbai, or for that matter in any Indian city. It doesn’t require the person to be highly trained, it just requires the person to be motivated enough to want to do it. It doesn’t even need foreign terrorists to use inflatable rafts to land on isolated beaches, or trek across high Himalayan terrain. It just needs local individuals with greed, grievance, or sheer malice to be persuaded to use locally available material — with some help from those who know who to rig up explosives — to plant a bomb or three. If our cities don’t suffer terrorist attacks more regularly, it is, to some extent, because our much-maligned police forces manage to foil some conspiracies. The main reason might well be that not too many people want to commit terrorist attacks. If they did, we would see terrorist attacks become as common as other acts of serious crime. Tackling terrorism, therefore, requires us to ensure that terrorism doesn’t become more attractive. The greedy and the malicious can be deterred by raising their costs: if would-be terrorists are exposed, caught and punished, such people might not want to take the risk. Those with grievances can be harder to deter, so we need to ensure that we address them and don’t create new ones. It is impossible to completely erase grievances, but we can manage them. One way to do this is to strengthen social capital. It’s hard to do this in Mumbai, a city given to outpourings of selfless public-spiritedness during crises but abjectly lacking a public ethic otherwise, but it has to be attempted. Mumbai needs to link its social islands together more urgently today than at any time in its history. We cannot stop a really motivated terrorist, but we can make it hard for him to succeed. Our shopping malls, office buildings, car parks, bus stands and railway stations have installed metal detectors and the like and appointed security personnel to operate them. Let’s be honest: most of the time, it’s just a charade engaged in by both sides. The security people pretend to be checking us, and we play along. How many times have security guards asked to inspect the boot of your car without even bothering about what’s on the back seat? The places for the rich and powerful — five-star hotels, government buildings and upmarket offices — are veritable fortresses. Most other places at most times just cheat. Yes, it’s not practical for a solitary metal detector to screen a crowd fast enough. That suggests we install more detectors or devise sophisticated methods to screen some people. In any case, the dishonest business of going through the motions has to stop. Do we introspect on our own lack of diligence with a tenth of the energy we use to, quite rightly, blame the government for failing to prevent a bomb blast? Similarly, does it register in our collective mind that our emergency services are pathetic? After Wednesday’s bomb blasts, bodies and survivors were carried to hospitals in appalling conditions. Why do we have such poor and so few public service ambulances? Is our fire brigade really equipped to handle a city of over 13 million people? Why, do we give way to emergency vehicles while driving everyday? If we cannot prevent diabolical terrorists from trying to kill people indiscriminately, we can certainly try to mitigate the damage. At Thursday’s press conference, reporters asked questions about such things as intelligence failure and what India might do if the plotwere traced back to Pakistan. No one asked why it is that in the richest city of a country with claims to be a global power, survivors had to be bundled in the back of rusty cargo vans to be taken to hospital. Preventing terror attacks is very tough. Much of it is not in our hands. But making sure we take security procedures seriously is in our hands. So too is insisting that Mumbai have an adequate number of decent ambulances. It’s important to get the simpler things right first. Here is a preliminary, and hence, tentative assessment of yesterday’s terrorist attacks on Mumbai. 1. Regardless of who set off the three coordinated bomb blasts, it was an act of terrorism. Even if the explosives were set off by members of organised crime syndicates, as some initially suggested, they constitute terrorism. Terrorism is political theatre that primarily aims to create a psychological impact that then influences politics. Physical damage and casualties are secondary, as is the choice of ‘foot-soldiers’. 3. The timing of the attack (when the Pakistani military establishment is under severe pressure from the United States), the location of one bomb close to Shiv Sena’s headquarters and the non-claiming of responsibility after the attacks are three key factors that point towards the Karachi project. To the extent that such attacks create tensions with India, the Pakistani military establishment can reclaim the popularity it has lost among the Pakistani people in recent weeks. LeT has shown an dogmatic obsession with the Shiv Sena. LeT usually does not claim responsibility for its attacks. Unlike in other recent cases, where the Indian Mujahideen sent out long manifestos and grievance sheets to mediapersons soon after/just before the attacks, none have been received so far. There is also the matter of dates: many terrorist attacks have taken place either on the 13ths or 26ths of the month. Also, yesterday might have been the birthday of the sole surviving 26/11 terrorist, Ajmal Kasab. The initial statement recorded by Maharashtra ATS gives his birthday as July 13th, although in other records he gives it as September 13th. The absence of the usual claim of responsibility suggest that the Indian Mujahideen were either not involved, could not or did not risk sending out the email. (Although a caller from Yemen did claim it was their handiwork). It is possible that their capabilities have been impaired as a result of law enforcement and counter-terrorism measures undertaken by the Indian government since 26/11. 5. Regardless of whether the attacks are traced back to Pakistan, Prime Minister Manmohan Singh and his government will be under severe pressure, from the public, from the opposition and from within its own ranks, over Pakistan policy. His dogmatic pursuit of dialogue with Pakistan will be called into question, weakening him even further. 6. In March this year, when questioned on India’s response to another 26/11-type attack, P Chidambaram, the home minister, had stated: “If India is attacked again, and we are reasonably convinced that the attack emanated from Pakistan, we will respond swiftly and decisively.” Now yesterday’s attack was not quite on the scale of 26/11 but it will most likely be be traced back to Pakistan. Given the relatively lower level of provocation, it is unclear if the UPA government will swiftly decide to respond. 7. Cliched as it may sound, tensions with India are just what the Pakistani military establishment needs at this moment. Therefore whatever swift and decisive measures the Indian government undertakes must ensure that it does not do anything to make the Pakistani generals popular again. The United States has further reduced its goals in Afghanistan to the most parsimonious: limited to preventing terrorist and other attacks against the United States and its unnamed allies. At the same time, it has shifted the focus more to the East, to Pakistan. The withdrawal is likely to be stretched over time linked to political developments in Afghanistan. However, even if the withdrawal is precipitous,the United States will retain its offensive strike capabilities—think drones and special forces—in the region. In fact, these might even be scaled up as a counter to the ‘weakness’ created by lowering the number of combat troops in Afghanistan. These capabilities will both provide teeth to US diplomacy as well as allow it to place limits on the military-jihadi complex’s ability to escalate militant violence. The question for New Delhi is whether Washington will define these limits in such a way as to prevent terrorist and militant attacks on India, or will it see the latter as a necessary price to protect itself? Mr Obama’s calculation might work. He is, though, betting that US drone attacks and special forces operations will be possible and sufficient should Afghanistan’s political dynamic decisively swing towards surrogates of the Pakistani military-jihadi complex or radical Islamists of the al-Qaeda variety. Mr Obama has either accepted or ignored this risk, which informs the thinking of the US armed forces. The question then is: should the tide change towards the Taliban, during the process of withdrawal, will Mr Obama continue with the current course, or review the United States’ options? What happens to the jihadi militants that are currently being engaged by US forces in Afghanistan? What will they do with their ‘free time’ once they have fewer Western troops to fight against? Demobilisation of radicalised, violent and effectively illiterate men is a challenge that receives less attention than it should. This may yet be the most important factor that undermines the success of Mr Obama’s calculations. In many ways, transforming Afghanistan from a combat zone to a diplomatic war zone—with negotiations among the United States, the Afghan government, the Pakistani military establishment, Taliban forces and others—could be a positive for India. After all, New Delhi is much more comfortable, and arguably has many more options, in political games than military ones. Yet it is the only player without a strong stick. Also, given the UPA government’s domestic weaknesses, its ability to pursue a determined foreign policy course in Afghanistan is in some doubt.